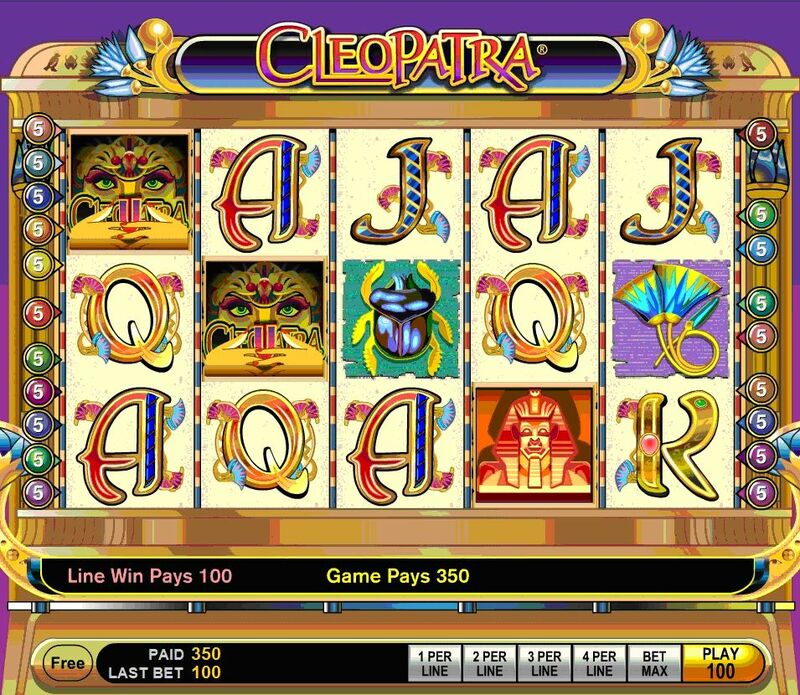 Cleopatra Slots is one of the most played slot machines out there – both online, and in the land-based casinos. I have a hunch that this is because of Cleopatra’s “seductive” voice (as the website calls it), but nevertheless the game is pretty entertaining. It plays cool Egyptian music the whole time and has some pretty cool looking graphics. The winning and losing isn’t very extreme in this game. You get a bunch of small payouts and you don’t lose as much money as fast as you do in the other slot machines from this casino. I find that I make more money when I only pay 1 credit per pay line. There are a lot of symbols that do not even count for any winning combinations, so even though there are 20 pay lines that come in all shapes, the amount of times you win is still just like a regular slot machine. The wild symbol is a picture of Cleopatra herself. It doubles pay outs when one or more of them complete a combination except for when there are three of them. The scatter symbol is the sphinx symbol. You need two of them to land anywhere on the reels and it will double whatever you bet. Three scatter symbols make you eligible for the bonus game. Whenever you get the three trigger symbols you get 15 free spins. It is very possible that you can win a lot of money in this bonus and it is very possible that you can win a very low amount as well. The good thing about this bonus is if you get 3 trigger symbols during your bonus play, you get another free 15 spins and you get can get up to 180 free spins. This makes it worth it because you are given the chance to make a monster amount of money if everything goes good. Cleopatra Slots is a good slot machine. This explains why it is one of the most popular slot machine games out there. You should definitely give it a spin.